The Junior League of Mobile (JLM) Advocacy Committee advocates and supports programs, initiatives and legislation that adhere with JLM’s mission and strategic plan while educating JLM members about important issues that impact our projects, programs and the community at large. As part of the JLM Planning and Research Council, this Committee stays current on state and local legislation regarding JLM’s current issues, and seeks to educate members and other stakeholders through publications or presentation. 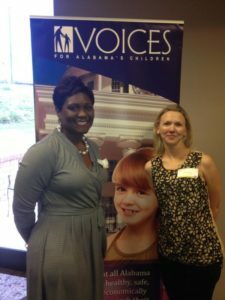 In August 2014, the Junior League of Mobile partnered with Voices for Alabama’s Children, a non-profit with the mission of ensuring the well-being of Alabama’s children, to advocate for its Healthy Food Financing Initiative. Research shows that one million Alabamians, of which 245,000 are children, live in food deserts, or communities with limited access to healthy food. Voices believes that if we are going to address childhood obesity, we must address healthy food access. The Healthy Food Financing Initiative is a policy initiative that spurs supermarket development by incentivizing small food retailers to locate in areas not currently being serviced.